Campbell Scientific has offered a full suite of desktop-based software applications for managing your data for many years. From the DOS days of Telcom and GraphTerm, to our current full-featured LoggerNet software suite, we have provided strong software products for use on your computer. But we also offer cloud-based solutions. Here are highlights of our Konect line of solutions. 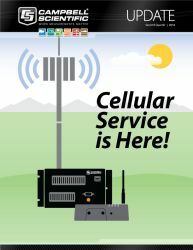 Konect Global Data Services (Konect GDS) is a solution for automatically collecting data from your IP-connected Campbell Scientific dataloggers, storing the data securely in a database, and providing a variety of data display components so you can view your data anytime and anywhere you have Internet access. While data is stored in the cloud, you also have the option of setting up a schedule to send data via email or FTP, or manually downloading data from within Konect GDS. Konect GDS supports access by multiple users who log in with a unique ID, and it offers a kiosk mode that allows you to provide public access to a data display. A set of drag-and-drop display components—including a variety of charts, gages, and tables—simplifies creating displays. Konect GDS uses responsive web design so that your data displays look great on a large desktop monitor or the small screen of your smartphone. Konect GDS is an ideal solution for those who want browser-based access to their data without the complications of setting up and maintaining a data collection platform and web server, or for those who need an answer to the security concerns that come with managing their own system. For more information about Konect, watch our Konect videos. 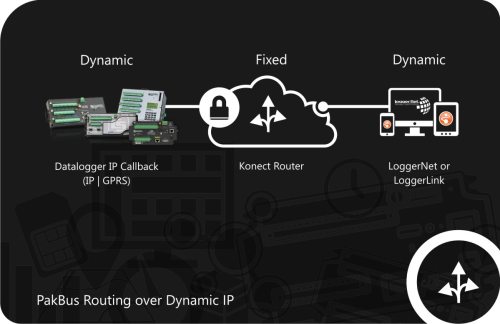 The Konect PakBus Router is a cloud-based routing service that provides a link between your datalogger and some other device in scenarios where these two devices would otherwise be unable to communicate because of security restrictions or non-public access to the datalogger. For instance, the Konect PakBus Router will allow LoggerNet running on a computer to connect to your datalogger, even if your datalogger is behind a firewall. With the Konect PakBus Router, both the datalogger and the software connect to the Router, and the Router routes the data between the two. 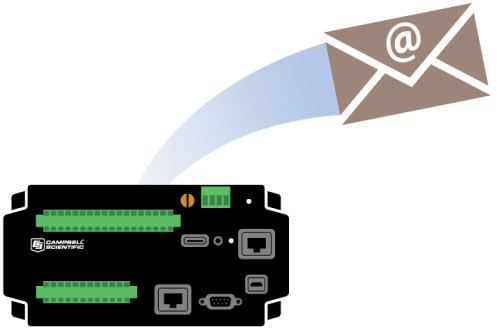 Since 2006, our IP-enabled dataloggers have been able to send emails using a function called EmailSend(). Sending emails has given our dataloggers the ability to issue notifications about the status of a station, transfer data files as attachments, or send an alert based on an alarm condition. Over the years, however, some users have run into problems finding an SMTP server to use. Publicly available free services can be difficult to set up and sometimes these services effect changes that cause your emails to fail. To solve this problem, we introduced the EmailRelay function. The backbone for EmailRelay is a Campbell Scientific email gateway solution, hosted under the Konect platform, which resolves the issues that come with relying on a third-party email provider. 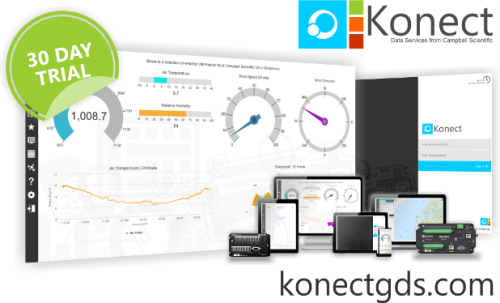 If you're ready to see all that Konect Global Data Services offers, sign-up for a free 30-day trial at the Konect GDS website. Learn more about our Konect products in our blog articles A Solution for IP Communication Problems: Konect PakBus Router and Sending Email from Your Datalogger Just Got Easier!